Closed End Fund or CEF is traded like stock. You can buy and sell or hold this fund through your favorite brokerage. The fund price may be traded on premium or discount from its fund’s Net Asset Value (NAV). This fund may be volatile than typical mutual fund hence it also uses a leverage to enhance its performance return. This leverage may also increase volatility and risk of the fund. Details about CEF can be found from my previous article. Similar to mutual funds, there are two main categories of fixed income closed end funds: Taxable Fixed Income and Tax Free Income or Non Taxable Fixed Income. Non Taxable fixed income CEFs are mainly focusing in Municipal bonds investment. These muni bonds are debt or obligation issued by a state, city, or other locality / municipality for general governmental needs or to finance specific projects. These muni bonds are attractive hence the interest is exempt from regular federal income tax. State specific bonds of the resident investors may also provide additional income free for the residents of those states. For Muni bond closed end fund, this is one of the largest single categories in CEF. It offers many national municipal bond funds and 18 state specific Muni bond funds including New York, California, Texas, Florida, Minnesota, Illinois, etc. The following 10 top performers are sorted based on its fund market price performance until June 2011. These funds were obtained from variety of financial website such as individual fund website, cefconnect, cefa, Morningstar, etc. 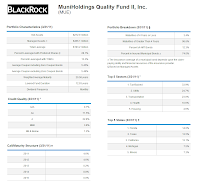 The Blackrock MuniHoldings Quality II fund objective is to provide investors with current income exempt from federal income taxes. 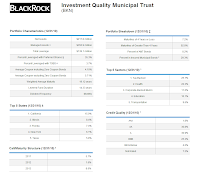 This BlackRock Muni bond CEF is investing primarily in a portfolio of long-term, investment-grade municipal obligations, the interest on which, in the opinion of bond counsel to the issuer, is exempt from federal income taxes. This MUE fund has total assets of $421.623 million. The fund charges 1.15% annual expense ratio. The fund market price is traded at -0.35% premium from its fund’s NAV. This fund also receives 3 stars rating from Morningstar. 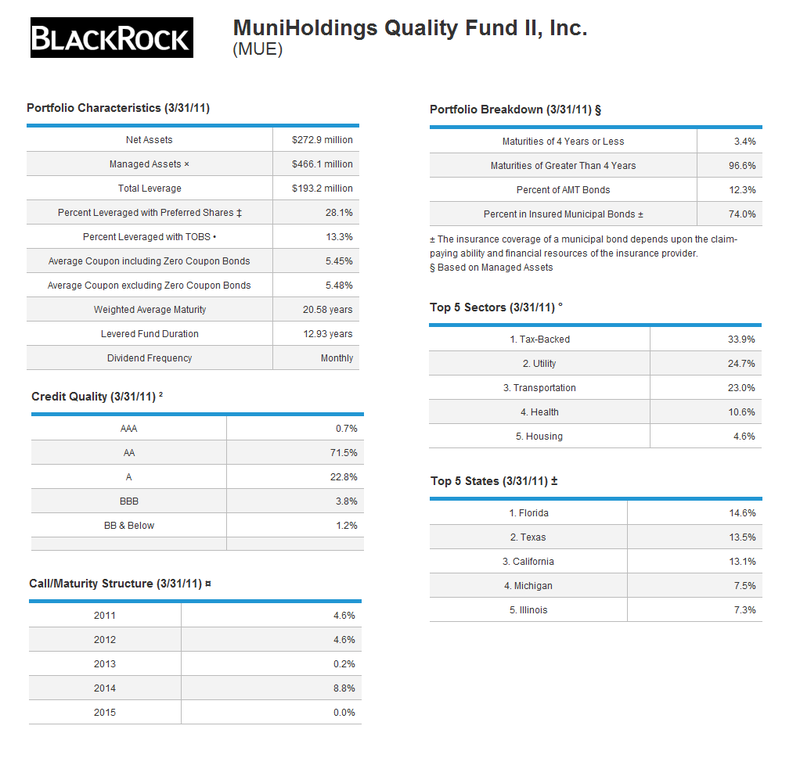 As June 2011, the BlackRock MuniHoldings Quality II fund’s yield is 6.47% per year. This dividend is paid monthly. Since its inception, the fund market price has returned 5.61%. The fund market price has returned 10.94% over the past three years and 7.49% over the past five years. As of April 2011, the fund top sectors are tax-backed (33.90%), utility (24.70%), transportation (23.00%), health (10.60%) and housing 4.60%). The top 5 states in this bond fund include Florida (14.6%), Texas (13.5%), California (13.1%), Michigan (7.5%), and Illinois (7.3%). The fund consists of 126 holdings and it has 12.93 years average duration. 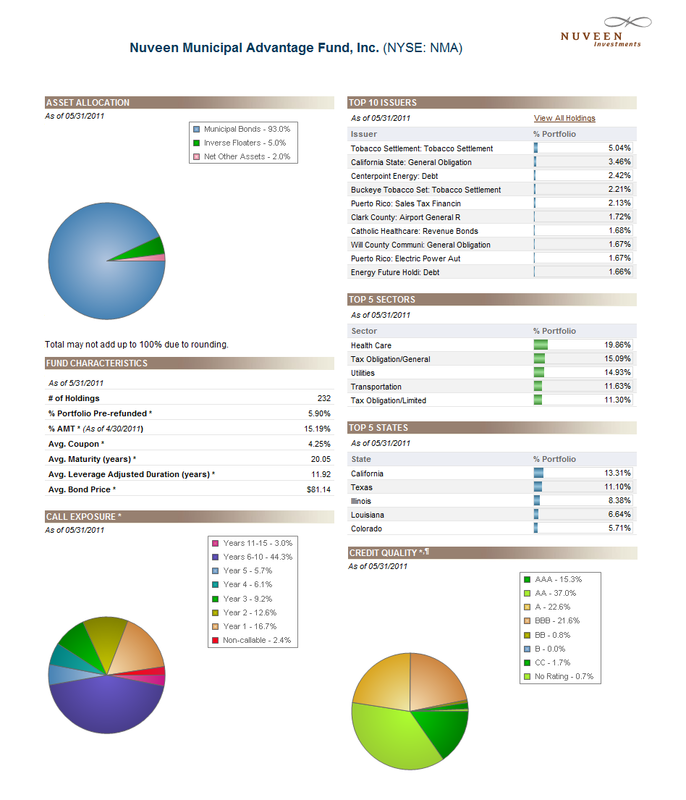 The annual portfolio turnover as of June 2011 is 20.00%. The percentage of assets invested in Insured Municipal Bonds is 74%. 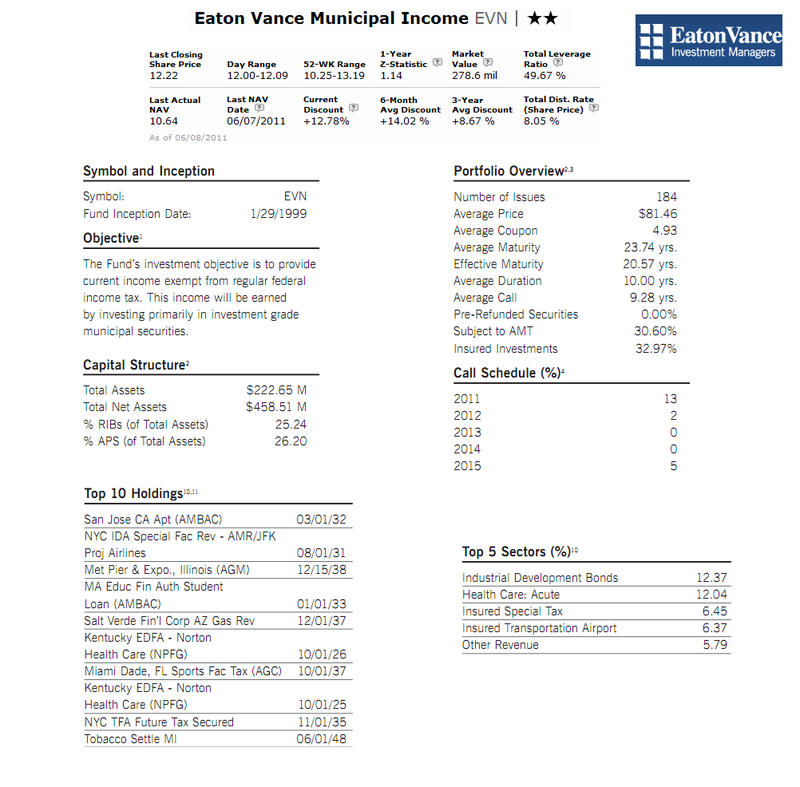 This EV Municipal Income Trust fund sponsor is Eaton Vance Management. The EV Municipal Income Trust fund seeks current income exempt from Federal income tax. 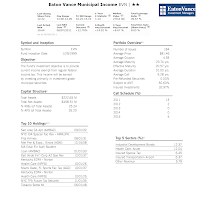 This Eaton Vance fund will invest most of assets in investment grade municipal securities. The fund manager is Thomas M. Metzold since January 1999. Morningstar has rated this fund with 2 stars rating. The total expense is 2.07% per year (including 1.73% baseline expense and 0.33% interest expense). The fund total net asset is 356 million with 49.83% effective leverage. The fund market price has returned 2.49% over the past five years and 7.14% over the past decade. The fund average duration is 20.70 years and the average maturity is 23.74 years. There are 185 holdings in this EV fund. 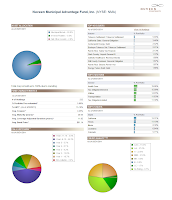 The fund annual portfolio turnover is 16%. As of March 2011, the top 5 municipal bond sectors are Industrial Development bonds, Health Care: Accute, Insured Special Tax, Insured Transportation Airport, and other revenue. The top 7 state municipals are Florida, California, New York, Texas, Massachusetts, Kentucky, and Arizona. As part of Invesco Advisers fund, this Invesco Insured Municipal Bond fund seeks high current income exempt from federal income tax, consistent with capital preservation. This Invesco fund will invest most asset in Muni bonds. The fund is managed by trio managers (Thomas Byron, Robert J. Stryker, and Robert Wimmel). This closed end fund current total net asset is $73 million. The fund also charges 1.28% expense ratio including 1.08% baseline expense and 0.19% interest expense. The fund market price is traded at 1.84% premium from its NAV. It also has 3 stars rating from Morningstar. The dividend yield is 5.63%. This fund has average duration (option adjusted) of 12.33 years and average coupon of 4.62%. The fund market price has returned 13.16% over the past year and 8.56% over the past 5 year. The year to date performance is 13.66% (until June 7th, 2011). The fund assets are allocated as follows Municipal bonds (98.8%), and Cash (1.2%). As of April 2011, the top 7 sectors of this Invesco fund is public power (14.4%), local GO (13.2%), hospital (9.6%), higher education (9.6%), water / sewer (9.6%), appropriation (9%), and Airport (6.6%). The fund’s top 5 states are California, Florida, New York, Texas, and Illinois. Nuveen is famous with its closed end funds. This Nuveen Municipal Advantage fund objective is to provide tax free current income from federal income tax. The secondary objective is the enhancement of portfolio value. This Nuveen closed end fund will invest most of its asset in national municipal obligations. This is also one of the largest Muni bond CEFs in term of asset with $614 million in this top performers list. The expense ratio of this Nuveen fund is 1.59% per year. The fund is managed by Thomas C. Spalding Jr since 2003. The fund market price is traded at 1.14% premium from its fund’s NAV. This fund also receives 3 stars rating from Morningstar. The fund is also has 32.82% structural leverage. The fund consists of 227 bonds. This Nuveen CEF has 13.23 years average duration and 20.14 years average maturity. As May 2011, the fund’s distribution rate is 7.00% per year. This dividend is paid monthly. Since its inception, the fund market price has returned 6.81% / year. As of April 2011, the fund top 10 sectors are health care, utilities, general tax obligation, transportation, US guarantee, limited tax obligation, consumer staples, net other assets, education and civic organ, and water/ sewer. 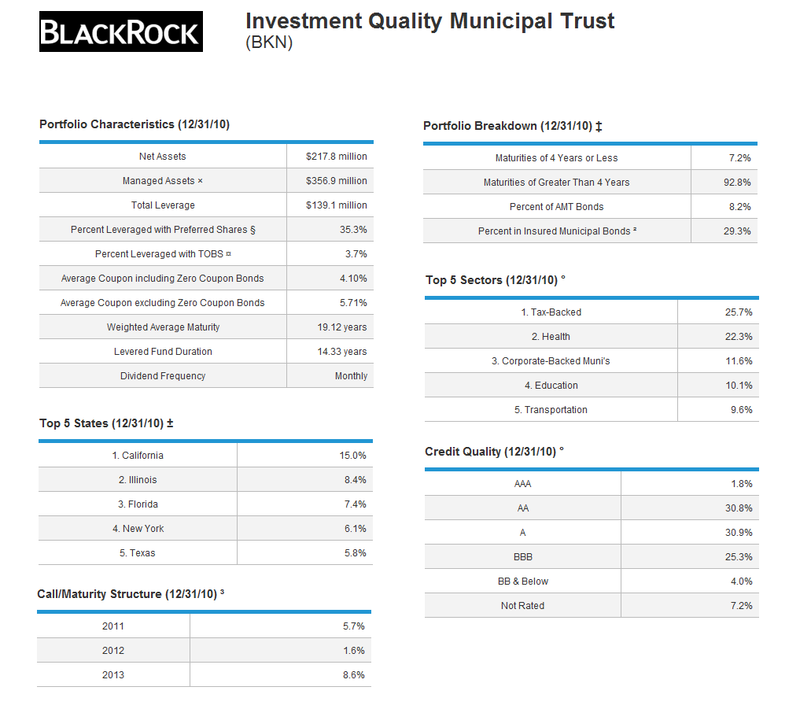 This BlackRock Investment Quality Municipal Trust fund is a perpetual closed-end municipal bond fund. BKN commenced operations in February 1993 with the investment objective to provide high current income, exempt from regular Federal income tax, consistent with the preservation of capital. The fund usually invests in investment grade municipal bonds. This municipal bond CEF is managed by William R Bock, Timothy T Browse, Robert A DiMella, Theodore R Jaeckel, Walter O'Connor, and Robert D Sneedon. Morningstar has rated this fund with 2 stars rating. The total expense is 1.11% per year (including 1.07% baseline expense and 0.03% interest expense). The fund total net asset is 352 million with 37.95% effective leverage. The fund market price has returned 2.98% over the past five years and 7.42% over the past decade. The fund average duration is 14.33 years and the average maturity is 19.12 years. There are 170 holdings in this BlackRock fund. The fund annual portfolio turnover is 43%. As of January 2011, the top 5 municipal bond sectors are tax backed, health care, corporate backed Muni’s, education, and transportation. The top 5 state municipals are California, Illinois, Florida, New York, and Texas.